“The greatest need now in Puerto Rico, and it seems it will be like that for a while, is for gas-powered generators,” a Latin American representative of Christian Aid Mission said. Christian Aid Mission has arranged for an 80-foot boat to transport generators from Miami to Puerto Rico but needs funds to purchase them. A trusted network of pastors on the main island will distribute as many gas-powered generators as donors can supply to desperate residents. Each generator costs $600. Founded in 1953, Christian Aid Mission seeks to establish a witness for Christ in every nation by assisting highly effectively indigenous ministries in lands of poverty, where Christians are a persecuted minority, and where foreign missionaries are not allowed. Photo: Residents Rosa (L) and Errol gather at their damaged home without power or running water about two weeks after Hurricane Maria swept through the island on October 5, 2017 in San Isidro, Puerto Rico. 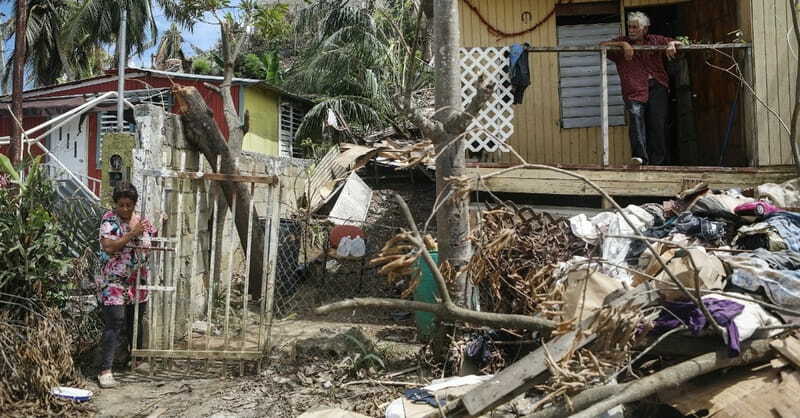 Puerto Rico experienced widespread damage including most of the electrical, gas and water grid as well as agriculture after Hurricane Maria, a category 4 hurricane, swept through.